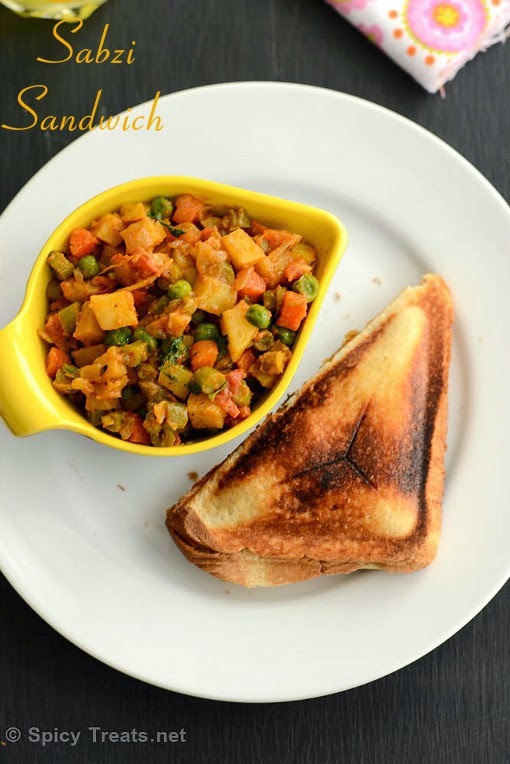 Spicy Treats: Sabzi Sandwich Recipe | Vegetable Sandwich Recipe | Mixed Veg Sabzi Sandwich - Easy Kids Lunch Box Recipe Ideas! Sabzi Sandwich Recipe | Vegetable Sandwich Recipe | Mixed Veg Sabzi Sandwich - Easy Kids Lunch Box Recipe Ideas! 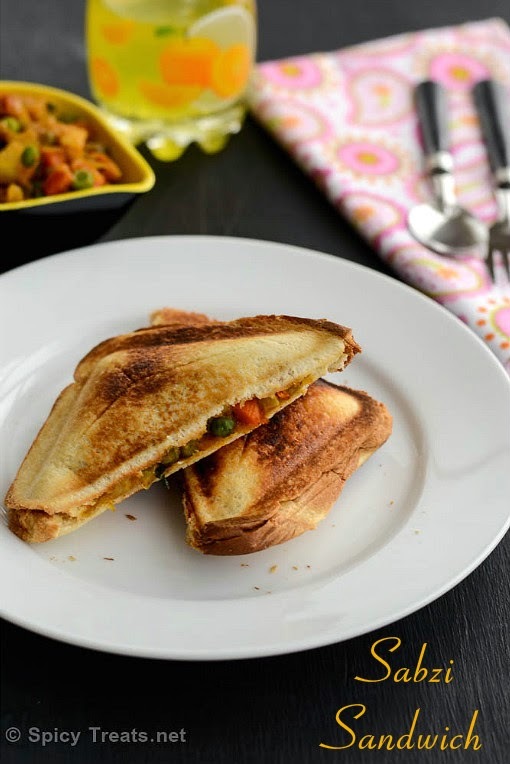 Sabzi Sandwich / Mixed Vegetable Sandwich is one my kids' recent favorite recipe. I often make sabzi for rotis, Sabzi is nothing but a dry curry or stir fry with vegetables. I used to pack roti roll with dry side or stir fried veggies for sanjay's lunch box. He likes stuffed paratha and roti roll a lot than rice. But making rotis in the morning for both breakfast and lunch is sometime hard for me, so as a quick fix instead of roti, I made Sandwich using Sabzi and it was super hit with kids. 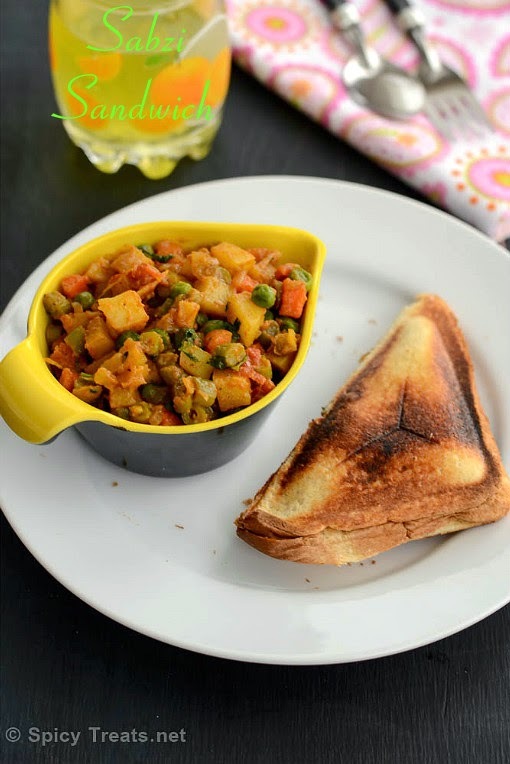 We all loved it a lot and from that time whenever I bake or buy fresh bread then it will be Sabzi sandwich for the following day breakfast or lunch. 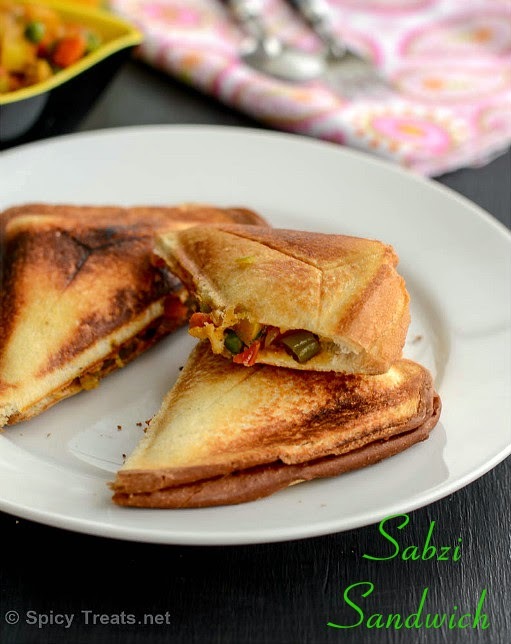 This Sabzi Sandwich is one of the best way to feed veggies to kids. You can use any number of vegetables for this sabzi, here I used carrot, beans, potato and green peas. Easy and healthy meal for kids. Even for adults this makes a filling and wholesome meal, I prefer whole wheat or multi grain bread for myself. Heat oil in a pan, add jeera and fennel seeds allow to splutter. Then add crushed ginger and garlic, saute for a few seconds. And then add finely chopped onions and saute for 3-4 minutes. After that add finely chopped tomato and saute until it turns soft and mushy. Then add green beans, potato, turmeric powder and stir fry for a minute and then add 1/2 cup water and cook covered for 3-4 minutes in medium heat. Then add carrot and peas and mix well and cook covered for another 3 minutes. Once the veggies are cooked add all the dry masala powders, enough salt and mix well and cook covered for another 2 minutes or until raw smell leaves. Trim the edges of the bread if you want and spread the butter or brush oil lightly on all the bread slices. Add 2 tablespoon or more of the Sabzi..if you want you can top some grated cheese also on top., cover with another slice of bread. Toast the sandwich in a sandwich maker or grill till golden and crisp. Spread some oil or butter on top of the sandwiches and pack it for lunch box. Sabzi sandwich hot out of the toaster... ummmmm good!